What is Nurses Night Out? Nurses Night Out is a night to relax, paint, kick-back with friends, and even let-loose with quirky games and a fun trivia competition for the chance to win paintable prizes! Nursing students, Nurses from the community, and even future nursing students are all invited. Join us for food, drinks, and a full night of releasing tension the way only Nurses truly know how to do! Come get to know your fellow Nursing students, talk with Nurses who work out in San Diego, and encourage those interested in the field. But most of all- have a fun night out that every Nurse deserves! 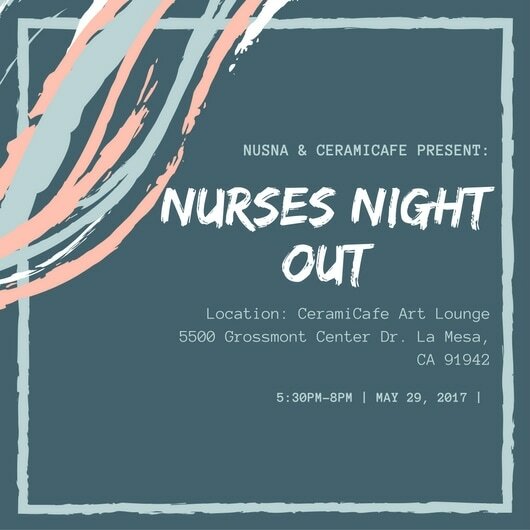 Date: Monday, May 29th, 2017 Time: 5:30-8:00 PM Location: CeramiCafe Art Lounge 5500 Grossmont Center Dr. Ticket Includes: Choice of ONE ceramic coffee mug, or travel mug, ONE meal (t.b.d. ), non- alcoholic drinks, & entry into opportunity drawings for the entire evening along with prize winning games! Presale Special till May 14th- Only $25! *Space is limited. It is highly recommended groups purchase early as possible to ensure a private table. What if I have a group of 4, 5, 6, or even 12 friends and we wish to be seated together? Seating is first come, first serve, but groups will be given a reserved table if they fill all the seats! (4,5,6 or 12) Once your group has purchased their tickets please email NUSNA.fundraising@gmail.com to reserve your table! Reminder that space is limited, to ensure you get a group table, it is highly suggested your group purchase as early as possible! What if I don’t want to paint a coffee mug or a travel mug? Good question! CeramiCafe Art Lounge Grossmont has graciously extended the opportunity for all ticket holders to upgrade to any ceramic piece on the shelf at a discounted price on the day of the event! Is the meal really a meal? Or is this a “snack” meal? It is really going to be a meal. We promise. The menu will be sent out once we have the pre-orders in so keep an eye out! Can I get a refund if I am unable to make it? Unfortunately, we cannot offer any refunds at this time, however, you can paint your mug/cup at a later date if you are unable to attend on the date of the event! Is this event kid friendly event? This event is geared towards future Nurses, Nursing students, and practicing RN’s but keep an eye out for our upcoming Family- Friendly Summer Fun Event! Where can I find more information on CeramiCafe? When will I get my Ceramic masterpiece? June 5th, we will have a pick up at Rancho Bernardo Campus. June 6th, there will be a pick up at National University Library on Lightwave Avenue. If you are unable to make either date please email NUSNA.Fundraising@gmail.com to arrange a pick- up time.